PT Tunas Baru Lampung Tbk (TBLA) is a subsidiary of the Indonesian Sungai Budi Group, an agribusiness company controlled by the Widarto Oey family. By June 2016, TBLA had planted 53,000 ha with oil palm in Lampung and South Sumatra provinces in Sumatra and West Kalimantan. TBLA is more focused on becoming a downstream oil palm company than being a palm oil grower. Costs of raw material equalled more than half of the company’s revenue in 2015. TBLA has not disclosed any third-party suppliers. TBLA does not have a public NDPE policy. The company is a member of the RSPO, and aims to achieve 100 percent RSPO certification by 2021. In its Annual Communications of Progress 2015 for the RSPO it however mentions a planted area of 19,000 ha only. The company has also never submitted any New Planting proposals to the RSPO, but it has cleared and planted oil palm in new concessions. Only 956 ha of the company’s planted area has been RSPO certified. As of Q3 3015, most of TBLA’s 6,000 ha planted area in West Kalimantan is located on peatland. Presently the company’s subsidiary PT Solusi Jaya Perkasa in Kubu Raya district clears peatland forests. The concession covers 1,800 ha. The forested areas have already been stacked and canals are constructed. As shown below in Figure 7, between April and September 2016 a large portion of the forests were cleared. Figure 7: Recent clearing of peatland forests by TBLA’s PT Solusi Jaya Perkasa (Kubu Raya district, West Kalimantan). 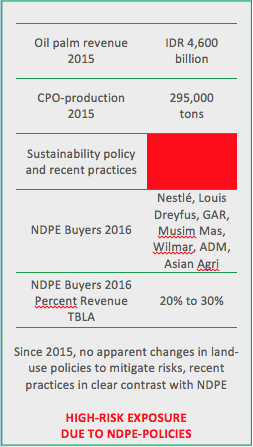 As shown below in Figure 8, early November 2015, President Widodo issued a presidential instruction to palm oil companies not to develop new palm oil plantations on peatlands. In November 2016, the ministry of the Environment and Forestry found out that TBLA’s subsidiary PT Dinamika Graha Sarana (PT DGS) was developing new canals and performing new planting in areas targeted for restoration by Indonesia’s Peat Restoration Agency (BRG). In addition, the company has failed to comply legally with the terms of its permit granted by Indonesia’s Environment and Forestry Ministry in 2012. Figure 8: TBLA’s PT DGS in Ogan Komering Ilir district, South Sumatra. In September 2015 the peatlands were burning. A year later palm oil development can be seen. PT DGS is 29.4% owned by TBLA, yet the management considers that it has de facto control of PT DGS. This is because TBLA’s controlling shareholders own the majority of DGS’ shares.